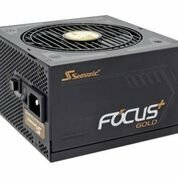 Seasonic engineers have created a brand new product line based on advanced technology emanating from many years of intensive active research. The result of this development is the solid FOCUS+ Series, which implements modern design and shows outstanding electrical performance. This power supply is small and entirely modular, which will be hard to resist. It is available in 80 PLUS Gold efficiency ratings. COMPACT SIZE - 140 MM DEEP; High power output to size ratio. FULL MODULAR; use only the cables you need to reduce clutter and improve airflow for a better ventilated system. 80 PLUS GOLD; 87% efficient at 20% load, 90% efficient at 50% load, and 87% efficient at 100% load. HYBRID SILENT FAN CONTROL; The industry's first, Seasonic patented, advanced three-phased thermal control achieves optimal between silence and cooling. This Hybrid Silent Fan Control functions in three operational stages: Fanless Mode, Silent Mode, and Cooling Mode. 10 YEAR WARRANTY; Our commitment to superior quality.